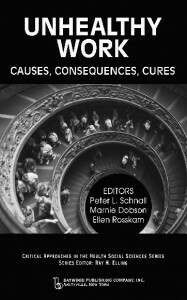 Unhealthy Work: Causes, Consequences, Cures – voted best labor book of 2009 – is available for purchase here at Baywood Publishing. 2. Schnall PL, Belkic K, Landsbergis PA, Baker D. (eds.) The Workplace and Cardiovascular Disease. Occupational Medicine: State of the Art Reviews. 2000;15.